Marvel is currently hard at work on their next wave of Phase 3 movies now that Captain America: Civil War has been released and Doctor Strange is in post-production. That means, all eyes will be on the 2017 slate, which includes the third film in the Thor trilogy, Thor: Ragnarok. And a long standing rumor may have finally been confirmed, along with some other cool details about the sequel. For quite some time, we have known that Mark Ruffalo would be appearing in the film as Hulk and that his role would be rather significant. Given that the film will be taking place in space, that led to a lot of speculation that Marvel was finally going to adapt what might be Hulk's most iconic storyline. A new report from JoBlo seems to confirm it. 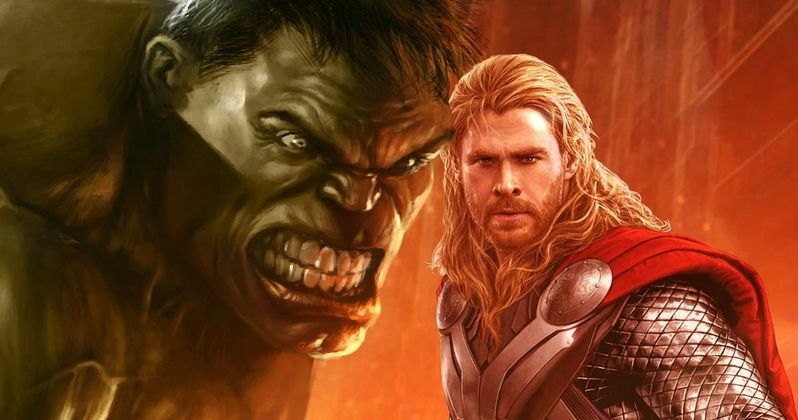 According to the report, Thor: Ragnarok will indeed be adapting Planet Hulk. "The film will definitely have the Planet Hulk element in it, operating as a kind of mash-up with the Ragnarok story. How Thor ends up on the planet in question is unclear, but he will definitely be involved in some gladiatorial games run by none other than Jeff Goldblum's Grandmaster." In addition to the confirmation that the film will be blending the two classic comic book storylines, the report also makes note that Hulk will be rocking his classic armor from Planet Hulk, which should look pretty fantastic on screen. The report also mentions that Chris Hemsworth will be joining Hulk for the gladiator battles and interestingly enough, will actually be rocking a shaved head for a portion of the film. The report also notes that Tessa Thompson, who is playing Valkyrie in the film, will have a very different look than her comic book counterpart. Lastly, it looks like Thor very well might be finding one of the last Infinity Stones during the course of the film, because he "needs to find the ultimate weapon to stop Ragnarok." In the comics at least, Ragnarok is a cyborg clone of Thor, so that could make for a very interesting second part of the story, outside of the Planet Hulk stuff. At this point, though this is labeled as a Thor movie, it is very much starting to feel like one of the bigger Marvel event films. In addition to Ruffalo and Hemsworth reprising their roles for the film, Tom Hiddleston will be reprising his role as Loki, maybe for the last time because he may be busy playing James Bond in the near future. Cate Blanchett is also playing the film's main villain Hela alongside Jeff Goldblum, who as mentioned is playing Grandmaster and Karl Urban who has been cast as Skurge. Thor: Ragnarok is set for a November 3, 2017 release and is being directed by Taika Waititi.